1. Wash the oranges and lemon thoroughly, then dry them in a clean tea towel. Pour 2 litres of cold water into a large, wide pan or preserving pan. Cut the oranges and lemon in half, squeeze and add the juice to the water. Reserve the pips and squeezed orange, but discard the squeezed lemon. 2. Cut the oranges in half again and, using a metal spoon, scrape the pith and pips into the centre of a large square of muslin. Gather up the edges and tie to form a bag. Add to the pan. Cut the orange peel into strips — chunky for coarse-cut or thinner for a fine shred. Add to the pan and leave overnight to soften. 3. The following day, bring the mixture to the boil, then reduce the heat and simmer, uncovered, for 2 hours, until the peel is very soft and the liquid reduced by about half. Remove and discard the muslin bag, squeezing as much of the liquid as possible back into the pan with the back of a wooden spoon. 4. Add the sugar and stir over a low heat until dissolved. Turn up the heat and boil rapidly until it reaches setting point — usually about 15 minutes. 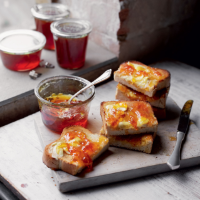 To test, remove the pan from the heat and spoon a little marmalade onto a chilled plate. Allow to cool for a few seconds, then push with a finger. If the surface wrinkles it's ready, if not, boil for a further 5 minutes and test again. Leave the marmalade to settle for 15 minutes, then skim off any foam from the surface. Stir the mixture and pour into warm, sterilised jars (see the Cook's Tip below) and place a waxed disc on top. Seal when cold, then label and store in a cool, dark place for up to a year. Once opened, store in the fridge for up to a month. To sterilise the jars and lids, wash in warm soapy water and rinse well. Place in a preheated oven at 150°C, gas mark 2 for 10 minutes until dry. If using kilner jars with rubber seals, boil them instead as the dry heat will damage them.